With your 3d-printer you now have a tool that can create almost anything you want, but you still might need to touch up your print and you will have to perform some maintenance. These are a few basic tools that can be very useful to make adjustments to your printer, remove prints or do light post processing work on your prints. Not all are necessary, but it's always nice to have the right tool for the job. Almost by accident we just happen to sell a tool kit that contains many of the tools mentioned here. Customers from the Nordic market can order that from here. Most of the screws on the Ultimaker printers are M3 hex screws (ISO 7380 to be specific). The printer comes with Allen keys which work ok but aren't the easiest to work with. Do yourself a favour and buy a proper screwdriver instead. You might also want to consider going with a Torx-driver instead of a hex-driver as it can get a better grip on the screw if it's stubborn. You should of course not need to use a screwdriver on your printer if it's working properly, but for maintenance it's nice to have a proper tool for the job. Let's face it, if you're taking things apart on your printer then your mood is probably not the best, a proper screw driver can remove one point of frustration. You'll need one 2mm for the set screw on the heaterblock and one 2.5mm for the rest of the screws on the printer. 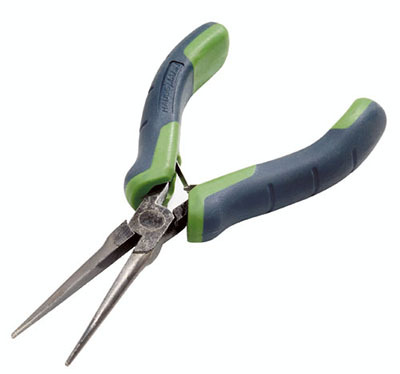 Pliers are great for grabbing and pulling off support material from prints. Go with a nice needle nose variety to get good reach. They also come in handy for reaching that annoying nut that had to drop into that corner of the printer that you just can't reach. 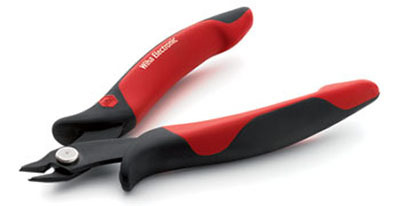 Flush cutters are great for removing support material from your prints. With flush cutters you can get nice and close to the actual print without damaging it. They also come in handy for shaping the tip of the filament before inserting into the printer (cutting a point into the tip of the filament makes it easier for the filament to go through the system). Maybe not so much a tool but more a necessary part of maintenance. You should keep the X-Y rods of your printer lubricated by giving them a single drop of oil occasionally. How often entirely depends on your situation, how often you print, how dirty they get and so on. Once a month is a reasonable starting point if you use your machine often. As a bit of a bonus you can also use the oil to help get rid of slight white marks on plastic that you have used sandpaper on. In addition to that, some people have also found it useful on tricky filaments such as NinjaFlex. A tiny drop on the filament helps lubricate the bowden tube to allow the material to slide easier. Besides the glue you use for the platform, you might also need some good glue for assembling prints. The type of glue you need will vary depending on what type of plastic you are trying to glue. Generic "Super glue" works ok for general purpose but isn't super strong, especially for PLA. For PLA you are better off using an epoxy for example. Or you could go with a plastic welding cement. This isn't a "glue" as you would think of it normally. This "glue" works by actually melting the surface of the plastic slightly so that the two parts actually fuse together. For PLA you can use Dichloromethane. This chemical is quite commonly used by model makers. Be aware though that this is a somewhat nasty chemical so only use it in a well ventilated area. For ABS you can use Acetone. This works in the same way that Dichloromethane works with PLA. Don't get nail polish remover though as that is full of other additives like oil and fragrances. Speaking of the platform. We usually recommend a different kind of glue than the stick you get with your printer. 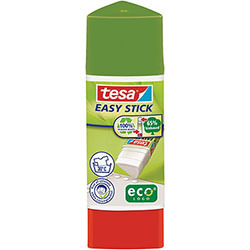 We've found that "Tesa Easy Stick" works much better than the included Pritt stick. If a print has gone well it will be stuck to the platform firmly. Letting the platform cool down fully will sometimes make the print pop off almost by itself. Sometimes though (or if you're impatient and try to remove it early, before letting it cool down), it will be stuck very firmly and you might need to persuade it, forcibly. For this, a simple putty knife is a great tool. It has a very thin and flexible blade that makes it easy to get in under the print and it wont break. In a pinch you can also use the blade from a utility knife. Just be careful as they tend to snap and send pieces of the blade flying. We include a gold leaf knife in our toolkit (Nordic customers only). 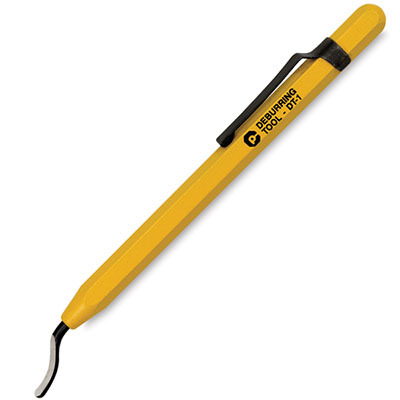 It's similar to a putty knife but has a longer, thinner shape that can make it easier to get in under large prints. Holes in a print tend to get smaller where they contact the glass platform. An easy way to get rid of this problem (besides adding a chamfer to the bottom of the hole) is to use a hole reamer. A few twists with this tool will open up the hole again and leave a nice clean edge. 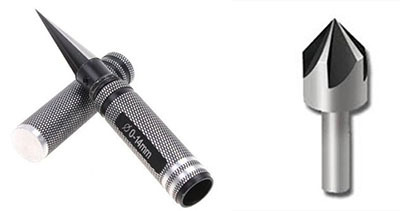 The main difference between the two tools shown below is the angle and that the hole reamer is only meant for softer materials (like printed plastic). Similarly to the holes mentioned in the previous section, you will usually get a flange like defect at the bottom of the print. This is formed because the first layer is squished into the platform and spills out slightly beyond the true dimension of the print. If you have brim enabled you will also be left with slightly ugly edges after you rip off the brim. Both of these are easy to get rid of with a deburring tool. 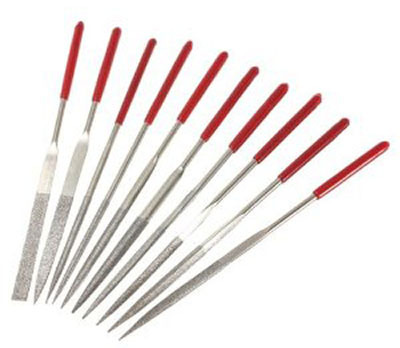 These are most commonly used to clean up cuts in metal but they work great of plastic as well. The great thing about these compared to using a knife is that they follow the edge on their own due to the shape of the blade and because the blade can swivel around in the handle. This means that you create a much cleaner and consistent cut whereas knives tend to dig in randomly and create an ugly edge. This should go without saying but a good knife is one of the most useful tools you can have. Besides a normal knife or utility knife (can serve as a tool to pry prints off the platform in a pinch) a couple of different scalpels is also a good thing to have. It's easier to reach into tight corners with the small blades and they have needle sharp tips that come in handy sometimes as well. A set of small files of different grades can be good to help clean up prints. Jewelers files are nice because they come in a lot of different shapes and sizes so you can reach that hard to reach spot. In particular they come in handy when removing support material as it can leave behind ugly scars on your print. Wet sandpaper is great for finishing prints or remove defects such as rough surfaces on overhangs. Get a set of wet sanding papers in a variety of grades. You can usually buy such a pack at hardware and autopart stores. Using wet sand paper and water helps prevent you from heating up a part so much that it start deforming due to heat. We've even used a power sander this way without problems. While it's possible to design and print ready made threads, this is usually only an option on slightly larger threads. If you need to create threads for smaller screws such as M3, you're better off using a proper tool to create these threads. You can buy cheap taps at any hardware store. Check the specifications for the tap you plan to use and design the hole in your part to be of a suitable size. Another, more brute force, method is to simply create your threads by friction. Use the screw you intend to create a thread for and simply screw it into the hole by force. The screw will heat up due to friction and create the thread for you. A thread like this will be very stiff however and if you're too forceful you just create a melted mess. Remember that tapping removes some material (especially if you need to drill out your hole, obviously) so make sure you use a big enough wall thickness to give yourself room to work in. If you don't you'll be left with a very weak hole that will most likely just shred apart once you start screwing in your screw.